Well it looks like my reverse psychology prediction actually worked this time. Tight game is what I went for and a four try bonus point performance is what the men in red served up. The Edinburgh encounter was by no means spectacular but it made for welcome viewing after the dour spectacle the weekend before against the Dragons. This weekend brings forth a Zebre side who have been surprisingly competitive apart from an opening day thumping by the Ospreys, they even led Connacht 22-10 a couple of weeks ago before the remaining 40 minutes was postponed. That said, I cannot see anything past a Munster win & I surely hope the performance versus Edinburgh will be built upon accordingly. The men in red genuinely look like they are finding some form and this will need to continue going into a hellacious October which takes in trips to Leinster and Ulster with a Heineken Champions Cup double header away to Racing 92 & home to Glasgow wedged in between. Tighten the arse cheeks now folks…. “Jack, Jack that 7’s got nothing he doesn’t want to tackle you, he just wants to go for the ball. Go on at him yeah”. “How’s Jack you alright bud…yeah…nothing you can do about that, it’s the game”. “You want me to carry that, yeah? Hit me if you want”. Upon uttering the final quote, CJ Stander sent Edinburgh’s captain Stuart McInally stumbling about three yards backward with his ball carrying shoulder, enough said. Winning his 150th Munster cap this weekend, the towering oak that is Donnacha Ryan becomes the most capped player in the current squad. Probably the angriest looking player in the PRO12, Ryan is immense in the contact & a fearsome tackler also due to his days on the blindside flank. Hugely experienced & with plenty left in the tank even at 33, he will look to make Mr Schmidt stand up and take notice coming into the November internationals. Although he will start tomorrows fixture on the bench, Carlo Festuccia is a huge player still for both Zebre and Italy. The elder statesman of the Zebre squad at 36, he has notched up over 50 appearances for Italy despite competing with Leonardo Ghiraldini & Fabio Ongaro for much of his international career. Will look to make an impact on tiring Munster legs off the bench this Saturday. The 6ft3in 17st9lb Gio Venditti has a decent try scoring record by any standards, regardless of the quality of his club side. An enormous physical presence in both attack and defence, the 36 time Italian international will provide Munster’s brightest prospect Darren Sweetnam with his sternest test yet. 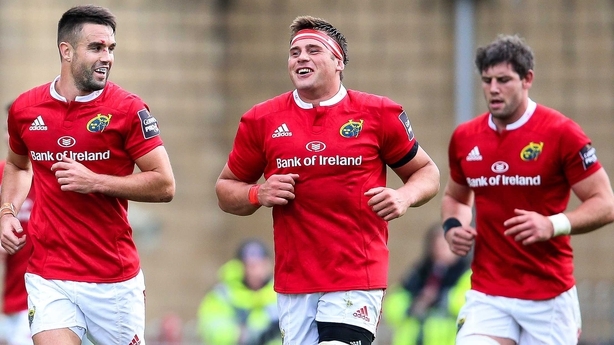 Munster are finally finding some form, and by god do they need it coming into a massive month of October. Two interpro’s and the opening Champions cup fixtures will be the sternest test yet of Rassie Erasmus’ fledgling Munster career. Zebre, for their worth have been competitive so far this season but I fully expect to see then men in red walk out of Thomond Park the victors by a healthy margin.